What I found stopped my heart and changed my life completely. Genealogy is a puzzle, a mystery that unravels and sorts itself out (sometimes with more questions than answers) the more you research. Finding missing pieces continually drives me forward. The more dead ends I encounter, the more compelled I am to push forward and discover my ancestors and the lives they lived. When I started researching my family tree with Ancestry.com, I couldn't wait to find answers about my paternal great-grandmother, Hannah English Stafford. Very little was known about her. I knew she died when my grandfather, Frank Stafford, was little boy, and my father said the cause of death (from what he understood) was a brain aneurysm. All that seemed a little vague to me, and I began the journey trying to discover more about her. My grandfather came from a small town in western North Carolina called Spruce Pine. Shortly after his mother's death, the 1930 census shows he moved with his father, John Stafford, and John's new wife, Sadie, to Washington County, Tennessee. Several years later, he met and married my grandmother and finally settled in Baltimore, Maryland, until he died in 1982. I began with my grandfather's birth certificate. The state of North Carolina started recording birth certificates in 1913, but I assumed since my grandfather lived in a rural area and was born in 1913, no birth certificate was filed. Therefore, in 1941, he applied for a delayed birth certificate. From this, I had his father and mother's names. My aunt also gave me her birth date, November 9, 1878, and death date, January 15, 1921. I plugged all this information in. And those little leaves started to show up. I found her in the censuses for 1880, 1900, and 1910 when she lived in an area near Spruce Pine called Snow Creek. In 1920, the census states she lived in the Grassy Creek area of Spruce Pine. This census particularly interested me because this is the last census before she died. Hannah was forty at this point, and my grandfather was a little boy of eight. She had a total of six children in her home in 1920, the oldest being 20, the youngest six. I can see they rented their home, and my great-grandfather worked as a laborer at the Harris Clay & Mining Company. Now I really needed to find her death certificate. 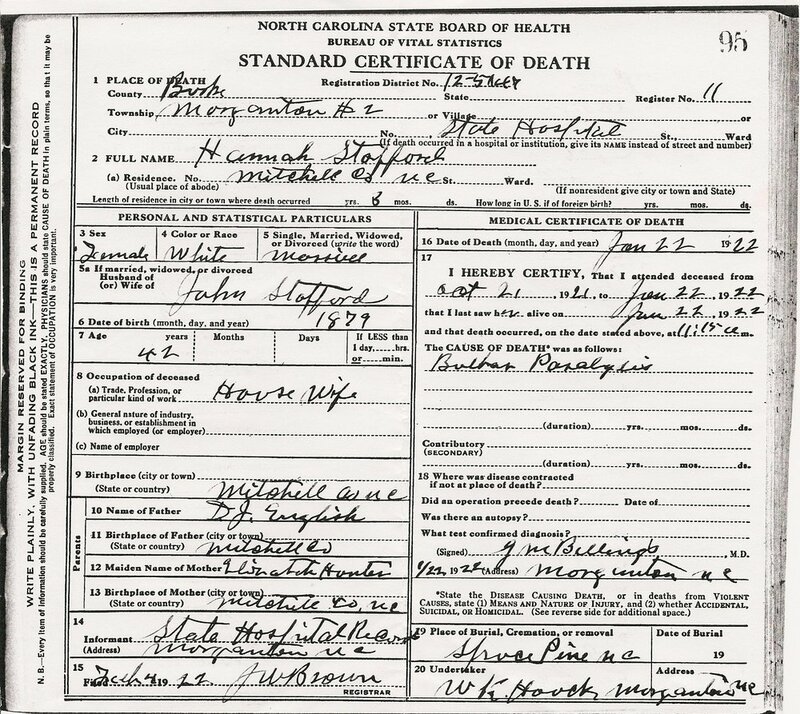 Even early on in my research, I realized how important death certificates are. Not only do they list the cause, date, and place of death, but they usually will give you the deceased person's parents' names and places of birth, a little gem taking you into the next generation. Hannah died in Morganton, North Carolina, a town a little over forty miles from her home. And she died at a psychiatric facility called Morganton State Hospital. No one ever mentioned this. Ever. The idea of a state hospital started all sorts of feelings and emotions running through me. Why was she there? What happened in her life to get her there? How much did my grandfather know? What was this hospital like? Who went there? I knew a journey had started for me. I needed as many answers as I could possibly find, and I would exhaust every resource until I found them.